Arsenal striker Pierre-Emerick Aubameyang has suggested it would be good to have Alexandre Lacazette in the team more after he was only introduced as a substitute against Manchester City. Aubameyang was given the nod by manager Unai Emery to start up front for the Gunners against City in their 2-0 opening day defeat at the Emirates Stadium. Lacazette later came on off the bench and looked lively, and Aubameyang admits he enjoys playing alongside the Frenchman as they have a good understanding. The Gabon international even admitted he’d be happy to change position and play more wide on the left to accommodate Lacazette, in what seems a pretty strong message to Emery to field the former Lyon man more often. ‘We really get on well. There is a spark between us when we are both on the pitch together,’ Aubameyang told ESPN. Should we be seeing more of these two on the pitch for Arsenal? ‘We look for each other, we saw it today [Sunday] against City when he came on. 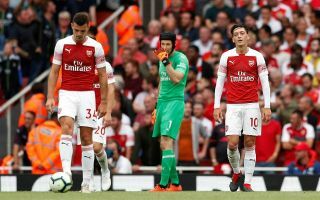 It remains to be seen how Arsenal will look tactically under their new manager, who will surely take time to really stamp his authority down on the team after taking over from his predecessor Arsene Wenger, who’d been in charge for 22 years. However, it sounds like an Aubameyang and Lacazette combination could be the way forward.